While most art activities for toddlers should be open-ended and focused more on the process than the end product, it is possible to plan appropriate projects that can fit in with your thematic unit. Toddler art projects will build fine motor skills, increase hand-eye coordination, and allow children to be creative. Be sure you know the developmental levels of your toddlers before planning. Having realistic expectations will help you plan engaging, as well as challenging projects. For a thematic unit, or lesson plan on bugs for Spring, try some of these grasshopper crafts. Toddlers will enjoy these fun projects that focus on the process of making art, yet still yield a cute end product. If possible, collect grass clippings with your toddler class. Give each child a small bucket in which to place a few blades of grass. Talk to children while they are collecting and tell them that grasshoppers make their homes in the grass. Save the grass clippings the children collected. Have children spread glue on the lower half of a piece of construction paper and sprinkle their grass clippings on top. Provide help when necessary. Allow the glue to dry overnight. Show children how to press their thumbs into the stamp pad and gently place it on the paper to make a print. Show them how to make a longer print using their pinky finger, and placing it close to the thumbprint, creating a grasshopper-like shape. Label the artwork with the child's name and date. Draw legs, eyes and antenna on the grasshoppers using a black marker. Show children how to crumple tissue paper squares into small balls using their fingers. Have children crumple as many tissue paper squares as they can. Draw a basic grasshopper shape on a blank sheet of paper and make copies for each child in the class. If necessary, use this basic grasshopper coloring sheet. Help children spread glue on their grasshopper shapes and place tissue paper balls on the glue. 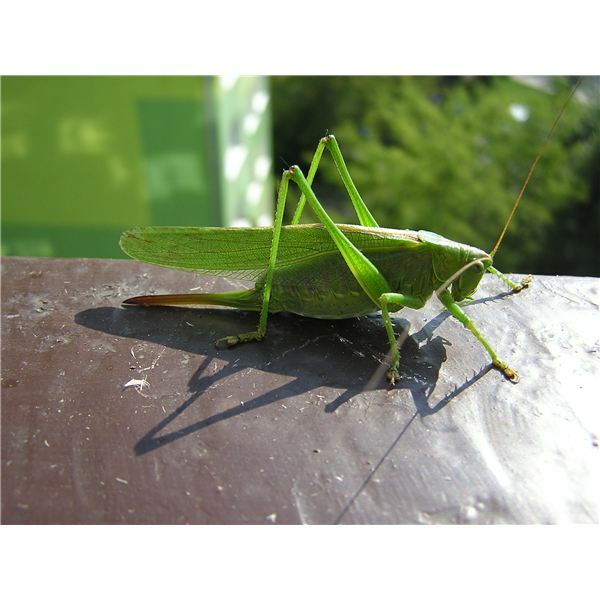 Discuss the hopping movement of a grasshopper with the children. Let children practice hopping in place and hopping in a line before beginning this project. In addition, show children with the plastic bugs how grasshoppers move. Spread out a large sheet of butcher paper, the longer the better. Have children remove shoes and socks and paint the bottom of their feet with green finger paint. Enlist the help of at least one other adult when conducting this art activity. Have children show you their best grasshopper hop from one end of the paper to another. End the hopping activity with a foot bath in warm soapy water. When the footprints dry, have the children try the same activity using the plastic bugs. Dip the feet of the bugs in the paint, and hop them across the long sheet of butcher paper. Compare the size of the grasshopper feet to the children's feet. These projects might make cute room decorations or a bulletin board display. Have any more ideas? Let us know in the comments!